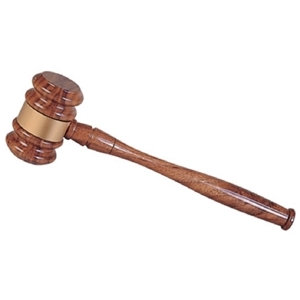 A gavel plaque measuring 12 X 9 inches and made out of genuine walnut, this is an excellent plaque when it comes to judicial recognition. 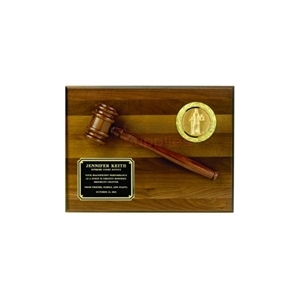 The plaque comes with a mounted wooden gavel, a 2 inch 'justice' insert and up to 4 lines of text (1 header followed by 3 lines of the main content). 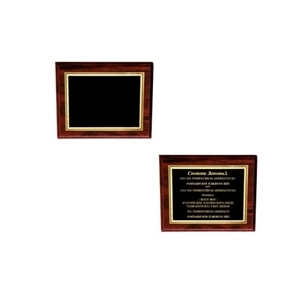 A genuine walnut plaque measuring 8 X 10 inches, accompanied by a 2 inch gold sales person insert and a black plate, this plaque makes for a worthy award to any sales achiever. Up to 6 lines of text (1 header followed by 5 lines forming the body) can be engraved on the included plate. There truly could not be enough ways to acknowledge exceptional performance in corporate culture. Work which outclasses the set benchmarks deserves to be commemorated, and ceremonial award plaques offer you yet another outlet to do so. In essence, ceremonial award plaques carry out the same duty as their brethren, ceremonial award trophies and medals, but they tend to be more occasion specific for corporate use. While award trophies and medals can be used to felicitate all achievers across all fields, ceremonial award plaques adopt a more industrial and minimalistic design that makes them more industry specific, and as a result, a growingly popular item as a corporate ceremonial award. 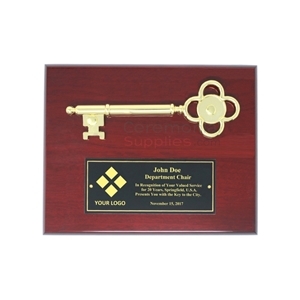 Generally, ceremonial award plaques follow a set structure; there is usually a base of an exotic polished wood, such as cherry, oak, birch, walnut or rosewood, and top of the base, there is a high gloss four-sided in-laid plate which can be made of fiberglass, polycarbonate or glass featuring ornate engravings which reveal the reason behind the receipt of the plaque. Often the plaques may also feature a metallic finish to the borders, the base and/or the inlaid plate, which can be availed in either gold, silver or a bronze metallic color. 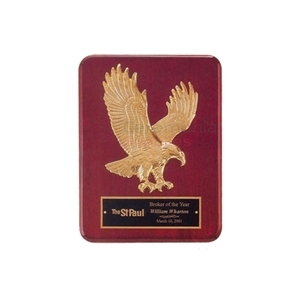 Ceremonial award plaques may also feature a decorative attachment in case the plaque is for a specific purpose, with the attachment being made out of wood, or another material finished in the same tones as the metallic trim featured on the plaque. Attachments can usually be found on ceremonial award plaques intended for specific purposes, such as when judges are felicitated. 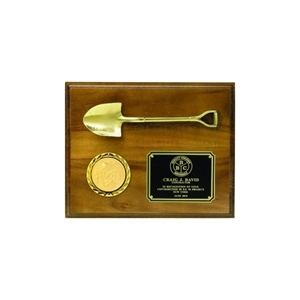 It is often seen that the ceremonial award plaques given to them have a gavel attached to them as a representation of the judge’s service to the cause, whereas in the business world, a top earning salesperson may be awarded a plaque that features a symbol of income like a money bag or treasure chest. 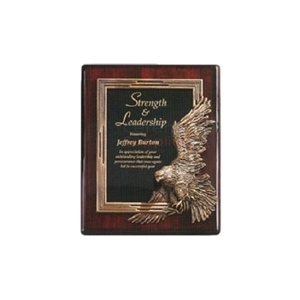 Ceremonial award plaques given to recognize corporate or academic excellence may vary in design. 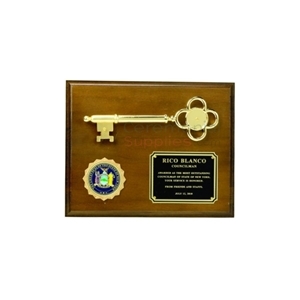 In the case of corporate achievements, the plaque is adorned by a two-dimensional embossed metal, or metal finished figurine representing the achievement. In the case of an academic achievement, the figurine might get replaced with a book, or in cases where an accoutrement is an option instead of a necessity, it is foregone with the plaque being dominated solely by the presence of the inlaid plate. Choosing the right award plaque for corporate business ceremonies can often be a dainty task even if the purpose for which it is to be awarded has been clearly identified, because of the sheer abundance of varying designs. 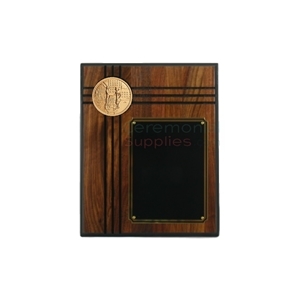 In a bid to permeate an absence of hassles throughout the buying process, CeremonialSupplies.com organizes corporate ceremonial award plaques according to most commonly used parameters, thus greatly simplifying the option identification process. Once the parameters are fed into the system, the right ceremonial award plaque can easily be chosen from the multiple available designs, and with the ease of the check-out process, you can be assured your purchase will be in your hands just in time to felicitate your corporate achievers!